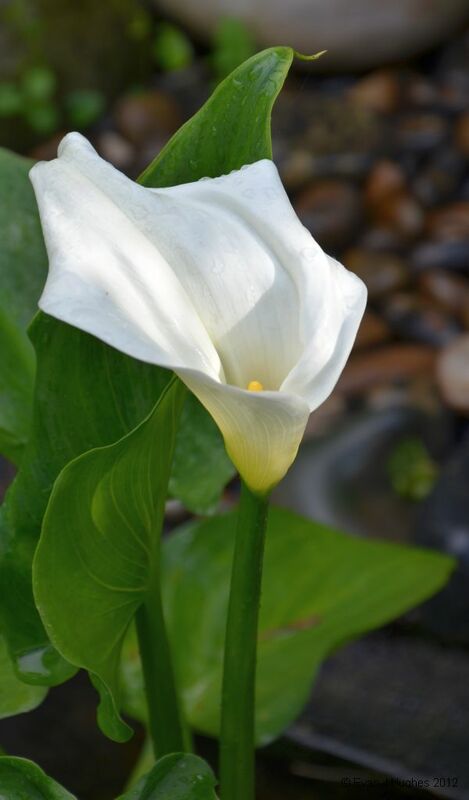 Although the water lilly in the pond is not flowering yet, one of the marginal lillies has decided to put on a show. It seems very happy there, although I am not sure whether it is wetter at the roots or at the bloom itself at the moment! The sun was shining while it was raining luckily so there are a few nicely lit water drops on the flower. 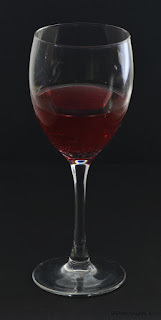 In continuing a theme of everyday objects, I thought I would try a classic challenge of photographing glass. 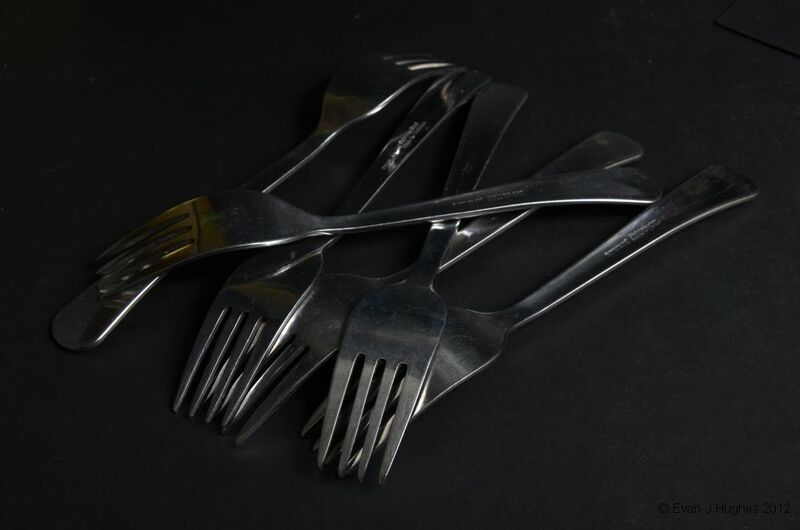 I decided on a low-key image again, similar to the previous one of forks (mainly as I still had the black-card to hand). 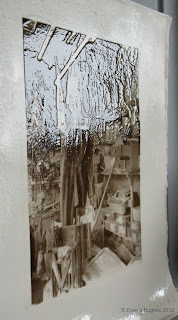 After a bit of thought, I realised I only needed enough black card to fill the image frame; everything else needs to be white around it so that it creates the highlights on the glass and makes the form visible. The glass is only holding blackcurrant squash unfortunately rather than wine, but still needed a white sticky label on the back of the glass in order to make the juice show up as red. I must think of something easier next time! At last the Blackcurrants are squishy enough to make them look sweet; they are still surprisingly sharp, but rather special. It has taken a while since they were green, but the sun over the last few days seems to have helped ripen them. I think I had better pick them soon before the birds decide to attack the crop the same way they made the redcurrants vanish. 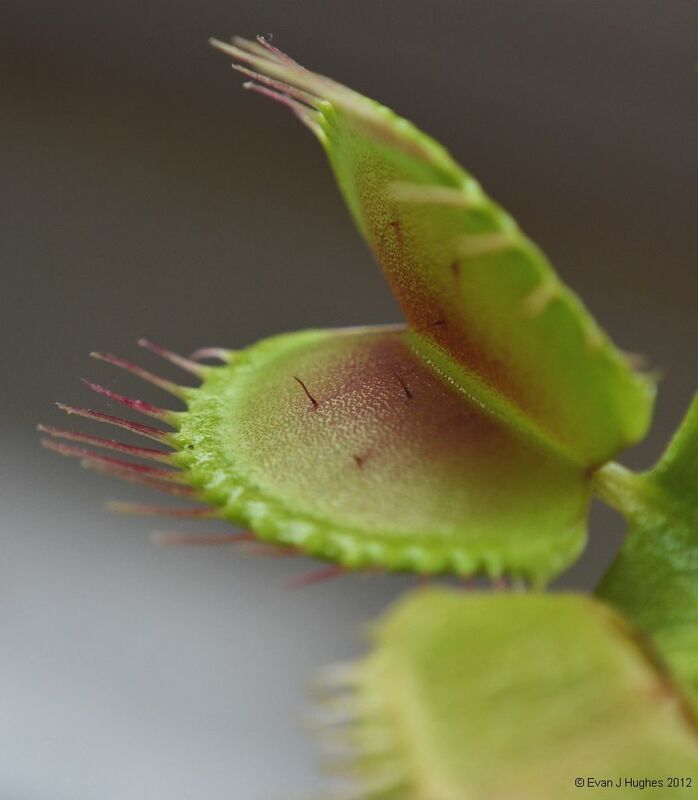 This was a first for me today; after many weeks of the bud growing slowly, the flower on Alex's Venus Flytrap has opened. 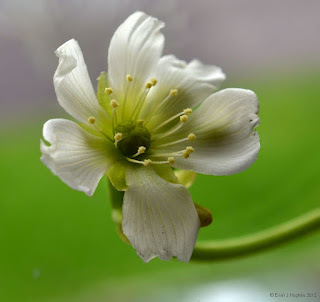 I have never seen a Venus Flytrap flower before. It is not what I expected. I thought it may be all green with 'teeth', a bit like the leaves. I realised today that despite all the drippy weather we have had for the last month or two, this is the first good sized garden snail I have seen active in the garden. 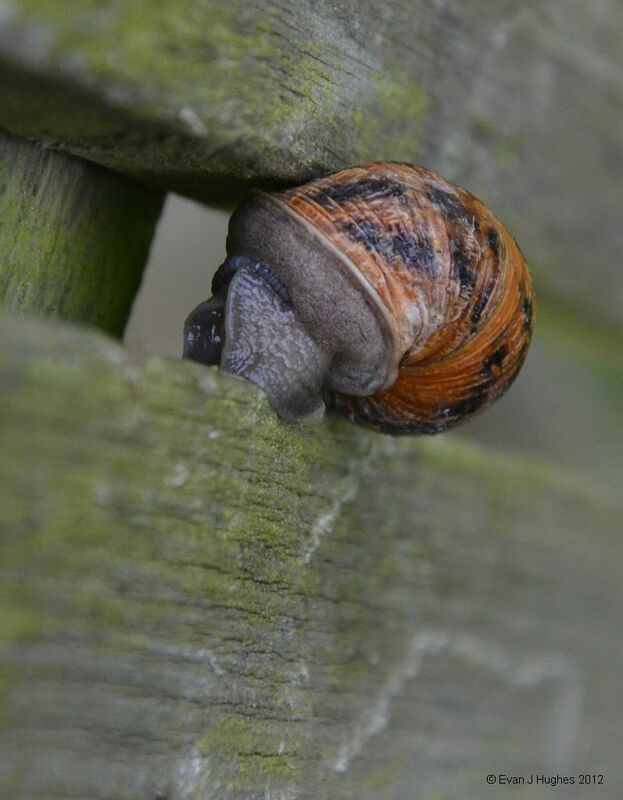 I have seen a few snails out in the fields, but not in the garden. Maybe that is why our Hosta's still have leaves on. I am not sure if it was the cold winter, or maybe some of our other garden visitors that have reduced the numbers of gastropods around. The rash of sun today has ripened the first of the Tayberries. 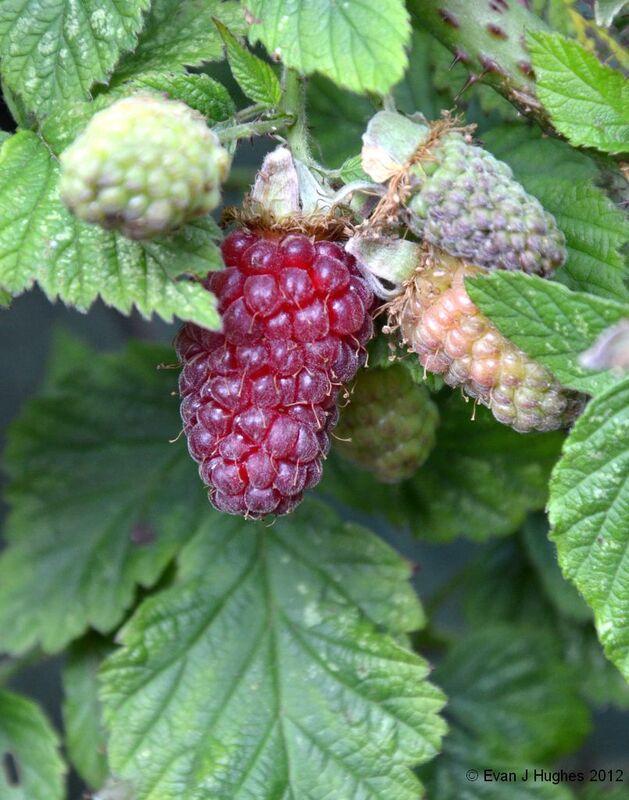 There seems to be a huge spread of ripeness all the way from red blush, through green and bullet like, to unpollinated flowers. 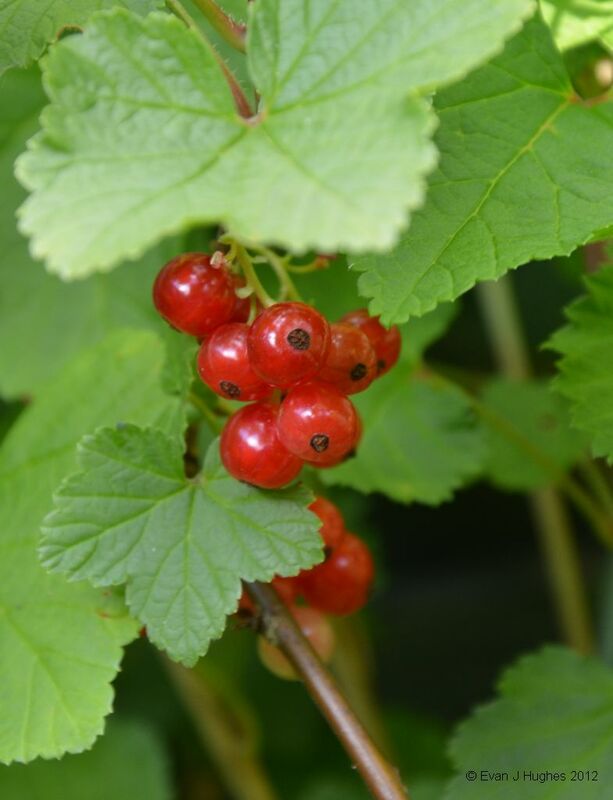 Given my experience with the red currants and the beady eyes and sharp beaks of the birds, 'I came, I saw, I ate'. Tough luck birds; better luck with the next one that ripens. 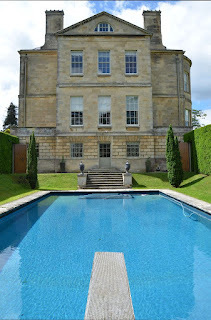 We paid a brief visit to Buscot Park this afternoon. The weather was nice and the children cooperated. 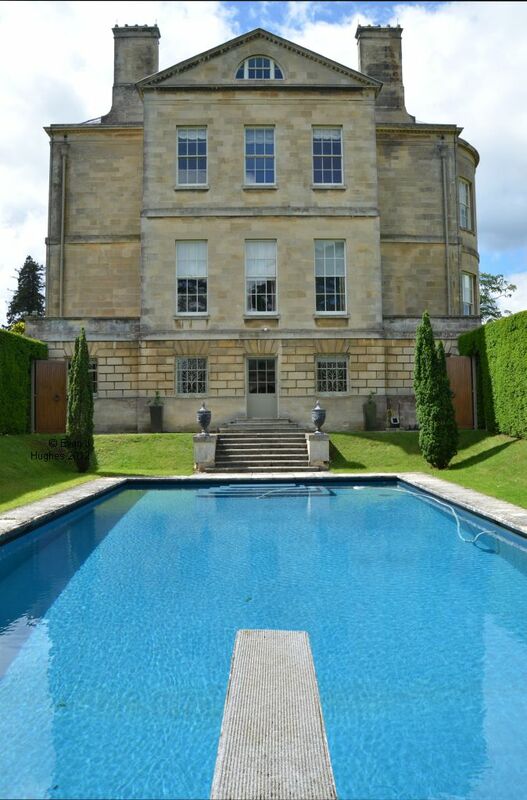 The children fancied a swim, but I thought it looked a little cold so we decided not too. 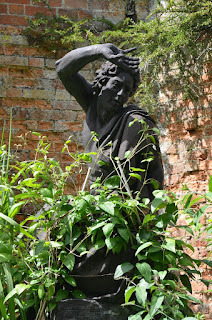 In an addition to yesterdays post, I noticed while walking round that Buscot has garden gnomes too. Their gnomes are a little more lifelike (and mostly made of metal), however they do not seem to be having as much fun as ours. 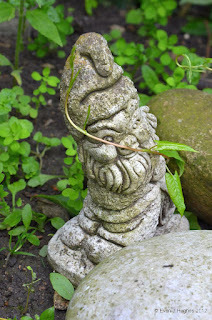 This gnome seemed to be reeling from the advancing Clematis; although it does look a little more like a scene from 'Day of the Triffids' than the bindweed in our garden. One of the Gnomes (we have two of them) has taken up residence by the pond. Over the last week or so, his smile seems to have grown broader as he has been entwined by bindweed. I had better keep an eye on him. 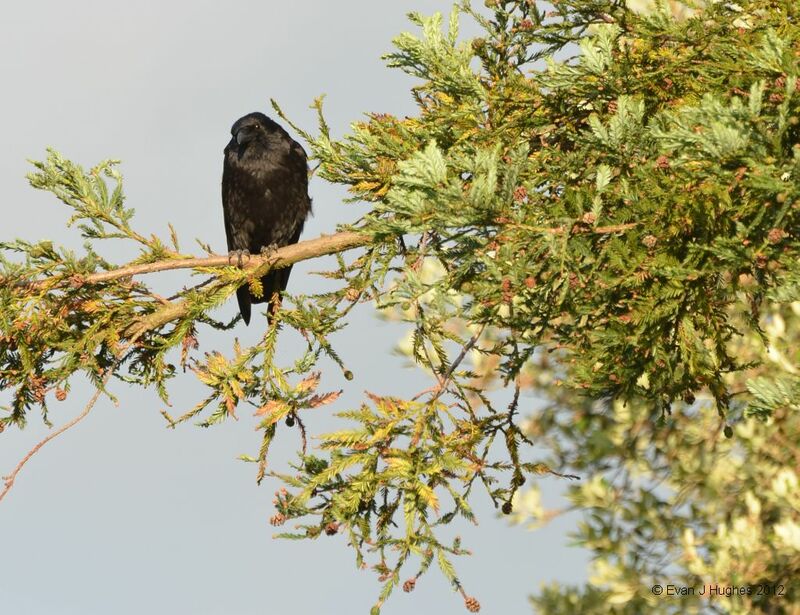 This Carrion Crow has been sat watching me for the last half-hour or so. The wind has ruffled its feathers and it has struggled to stay on the branch a few times. 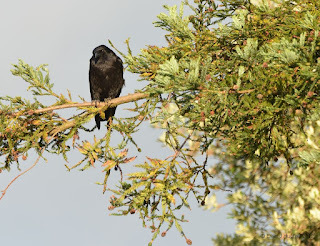 I wondered if there was anything of interest in the garden that it had its eye on, but it did not fly down at all. I gave up waiting for it to make a move; I went out and took its picture instead. It did not like being watched and flew off. This picture is a slight cheat in that it was not all taken today; only the very top trace was made by the sun today and a tiny amount of the images of the trees and houses. The picture is a Solargraph made by placing photographic paper in a tin can with a pinhole in the front and leaving it outside for 6 months to capture the passing of the sun. The can was set up outside our bedroom window on 21st December 2011 and has been there ever since. The lowest of the sun traces is from the 21st December and the whole of the Winter, Spring and early Summer has been captured. The 'thick' band of traces in the middle of the arc was where we had decent weather back in March; there are lots of gaps in many of the traces though showing how rotten the weather of some of the weeks was! The can now has a fresh sheet of paper in it and is already looking out from under the eaves outside the bedroom; hopefully the water will stay out of the can until December 21st when I shall post the next 6 months of sun. This little pest made itself known today; it was hard to miss wearing its red coat. 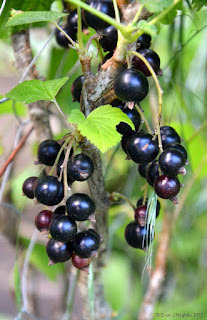 Back in April, I posted the 'green' version of the currants; I thought they were black currants. Ok, the observant will realise that the blackcurrant bush I had from my sister's garden were not blackcurrants after all and that these are actually already ripe! Summer must be here at last as the Red Hot Poker plant is finally putting on a decent display. The bees love it. There was much activity down by the canal this Fathers Day. This Damoiselle fly did not have much luck, but at least it kept nice and still while I was photographing it. The dog had a great time, including the obligatory swim and a brief attempt to roll in Swan poo. To add to the excitement of the day, the afternoon was spent helping to catch a swarm. It was not the most convenient as it was around a post. With lots of smoke and patience, the swarm crawled and buzzed its way into the box. 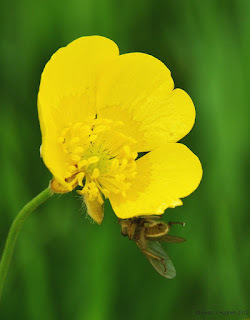 It was entertaining taking a few of the pictures as the bees did not really want us there! Hopefully they will settle happily into their new hive over the next few days though. 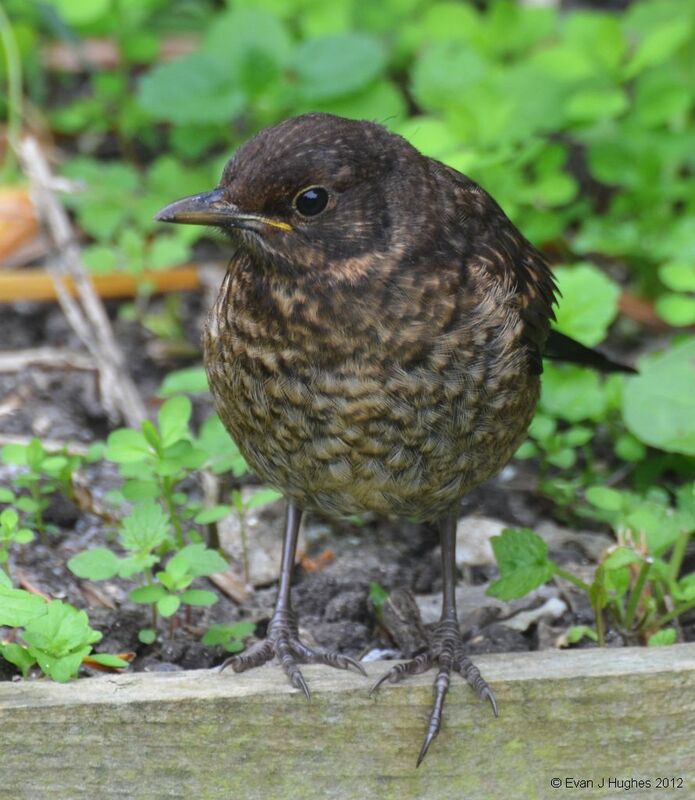 I remembered that there were at least two baby Blackbirds in the nest we had in the Jostaberry, but until today, I had only ever seen the one. I wondered if the second chick had met a sticky end just after fledging. By the look of the 'affection' between them today, it appears each wishes the other had met a sticky end after all! It is nice to see the Blackbird population has increased a little this year. 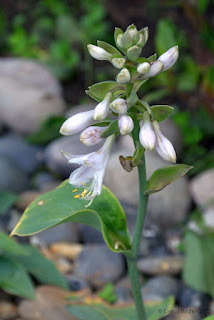 It has been a really long wait, but at last the flowers on the Hosta are starting to open. The white buds formed weeks ago and I am not sure if it just the weather turning colder, or a plant with a sadistic streak, but it has been quite odd how long it has taken. I wonder if the slow flower opening means that Hostas are pollinated by slugs? I wanted to try something a little different today; take some ordinary everyday objects and capture them in a way which was a little 'out of context'. 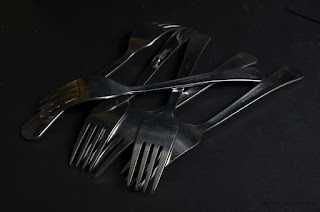 I thought a fork was a good everyday object to start with and being shiny, we always see it reflecting the world around us. The challenge I gave myself was to capture an image of a shiny fork (and keep it looking shiny), but without the world around us reflected in it. My conclusion from the exercise is that if you do not want to see the world reflected around you, it takes a lot of black cloth. The pond is really starting to look the part now; lots of smeg collecting in the corners and 'things' moving about in it. 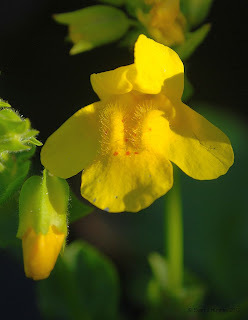 The marginal plants are also looking good; this one is Mimulus guttatus, otherwise known as the Monkey Flower. It reminds me of a giant snap-dragon, but I prefer to have Monkeys than Dragons lurking in the deep. 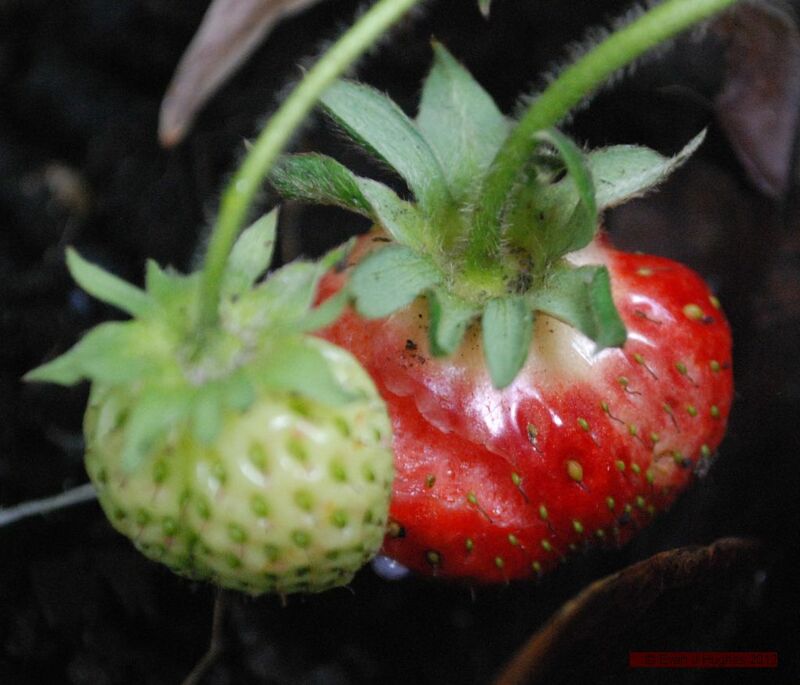 As Wimbledon is nearly upon us, our first strawberry is just turning red; a good week late but very welcome. Some evil creature has attempted to eat it before me so I have put a cage around it to allow it to ripen a little more. It is quite gnarly looking on the underside though, so I may pass-up having the first strawberry and give one of the kids the privilege; hopefully the second-ripe one will be a much more tempting specimen! As a smell, nutmeg is very distinctive and identifiable. 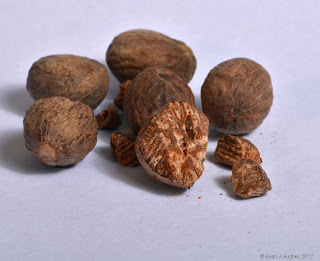 In Elizabethan times, the nutmeg here would be worth a significant amount of cash as it was thought to ward-off plague. No such luck with curing ailments, but tastes great on top of rice pudding though. 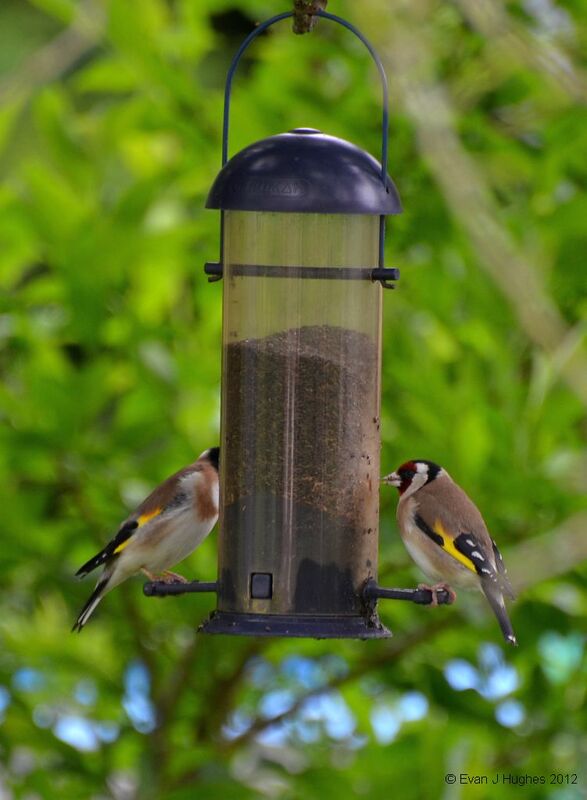 The Niger seeds are a bit of a pest to handle as they are so small and fine; the feeder seems to generate a static charge as you fill it and the seeds all try to fly out. It is well worth it however as it does attract in the Goldfinches. They are not very regular visitors, but they are rather spectacular when they do decide to drop in. In comparison to the vile weather yesterday, today was bright and sunny, with just the remnants of the strong winds. 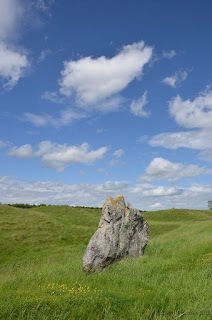 We took a trip to Avebury to walk the circle of stones. There were many who had the same idea so finding a view of the stones and scenery without others in the picture was tricky. The view was gorgeous however and the kids were pretty well behaved so all was good. 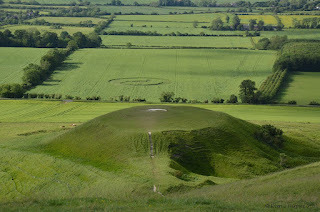 On the way back, we went via the White Horse at Uffington (which I still contend is really a rabbit) and walked up to just above the monument itself. The view from the top down over Dragon Hill was spectacular, in particular someone (from the local pub by the looks of it) had tried their hand at making a crop circle; with a little more practice and a little less beer, they may manage something for aliens to be proud of! A few weeks ago, it was announced that for some insane reason, Biffy Clyro were going to play the Oasis in Swindon. The sports hall at the Oasis doubles as an event arena but only holds about 3000; Biffy usually play venues holding crowds with another zero on the end! Luckily the ticketing website crashed on the day the tickets were put on general release, so after a quick trip to the Oasis box-office in town, I scored some tickets. The rest sold out shortly after. After a wait outside in a cold queue that would have scared the life out of a brass monkey, a fun time was had by all. The music was loud, the lights were bright and the crowd were *really* sweaty! The support band were very good too which is always a bit of a lottery (I have seen some real rubbish over the years!). The support was Pure Love, a relatively new grouping apparently fronted by Frank Carter, previously of Gallows. For a bit of added excitement (and the sound guy and securities worst nightmare), he even came and sang next to us in the crowd. I thought the root of all evil was 25.81 (think about it ...) but today Alex and Katy may have demonstrated that it is '63' instead. 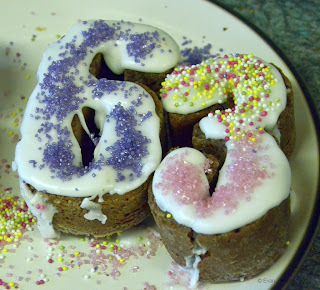 Why just smear a cake in icing when you can overload it with assorted garish sprinkles too? They will want candles next. Colours: Red, Blue or Purple? 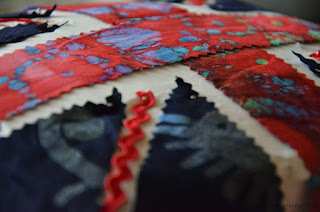 With all the red, white and blue of the Jubilee going on over the last week, I thought I would 'officially' consider a theme of colours (despite posts on yellow and another purple previously) to go with textures and smells. Any one commenting with "what's soft brown and smells of ..." will be in trouble. I thought I would start with a colour that is a bit of a conundrum; Purple. We know that you can make purple by mixing red and blue paint, but these are at opposite ends of the spectrum and so about as far apart as the eye can perceive, yet when mixed, we see one colour. Often though, when we consider a rainbow, we know it starts with red but then goes 'blue, indigo, violet'; I have heard folks refer to the violet end as purple, yet it is really about as blue as we can see. 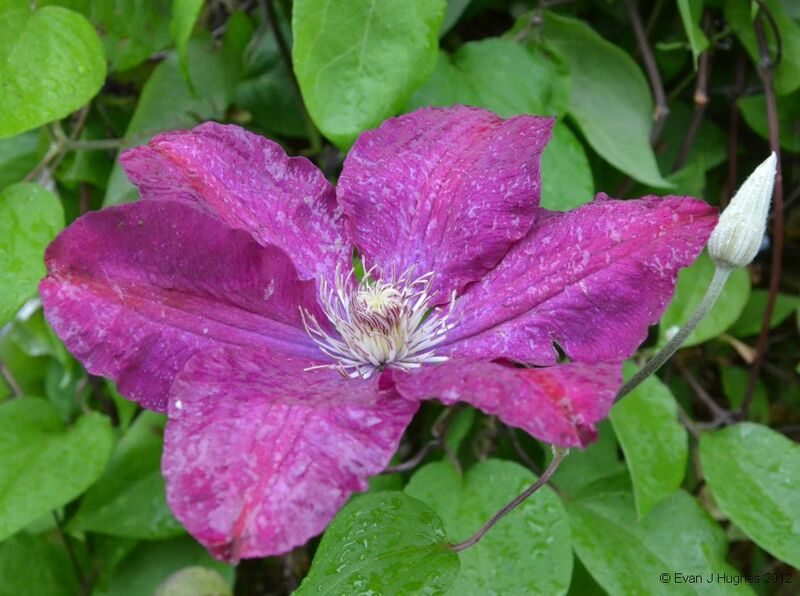 The clematis flower is interesting, in some light and from some angles it looks quite red, from other angles it can look quite blue. Some may say 'it is magenta', others may contend it is too red to be a real purple. However you like your purple, at least it is not generally a colour to worry about treading on. 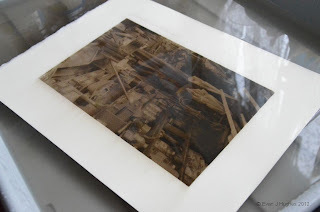 I have made the most of the extra days holiday today by having a printing session. The masochistic streak in me appears to be made of soot; it is soot that I am using to do the printing and oh, how fickle it is. The carbon transfer printing process stems back to Poitevin in 1855, and later a practical form patented by Joseph Swan (of lightbulb fame) in 1863. 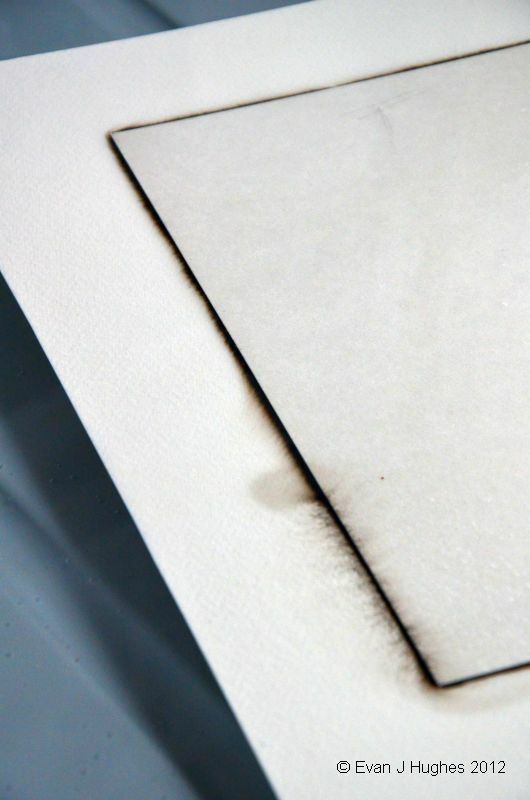 Carbon transfers are still about the most archival printing method known to this day. The process starts by mixing soot and gelatin and pouring out into a black sheet called 'tissue'. This tissue is poured onto a carrier paper so that it is easy to handle. 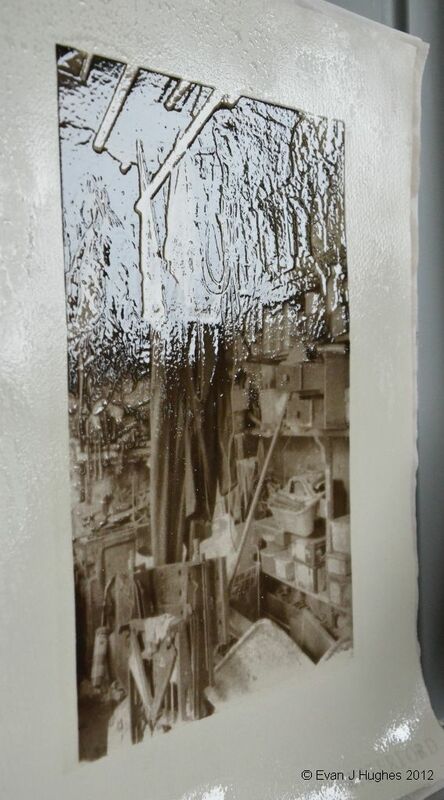 Once dry, the gelatine tissue is made light sensitive by applying potassium dichromate and then squashed together with the image negative and exposed to ultraviolet light. The fun bit comes next. The sandwich of papers is then placed in a bath of hot water, whereupon the soot-laden gelatine starts to melt; it is interesting watching the gelatine ooze out of the sandwich as in the picture below. The image is currently a black mass of dissolving goo. 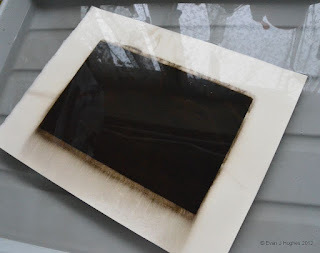 The paper is then floated face down in the hot water for about 15 minutes and hopefully all the gelatine that was under the dense parts of the negative and did not harden with the UV light detach and sink to the bottom of the tray. The next round of expletives is if the image also detaches and sinks! The wet carbon print has a very interesting characteristic; the more UV light hit the gelatine when being exposed, the thicker the layer (and so the more soot) that is left. 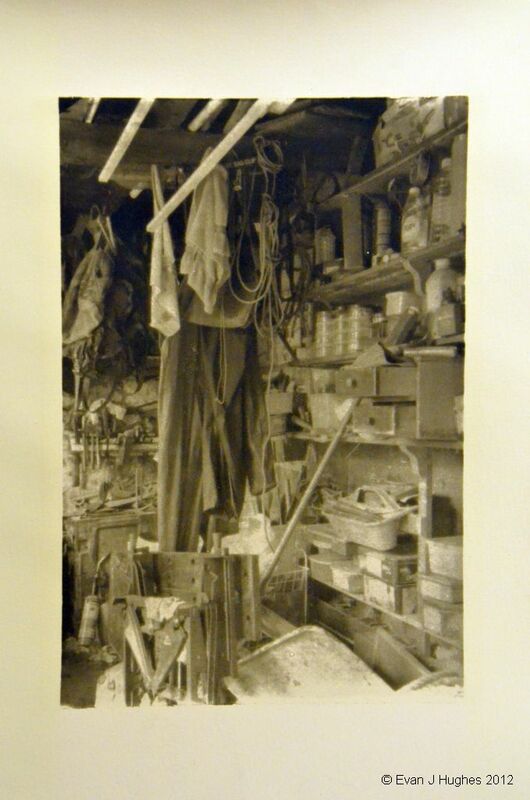 The result is that a strong relief image is visible in the wet print (as in the image below). Some carbon printers strive to get as thick a relief as possible so that even when the image is dry, there is still some textured relief visible. EDIT: 8/7/12, I have added a page describing the process in much more detail here. 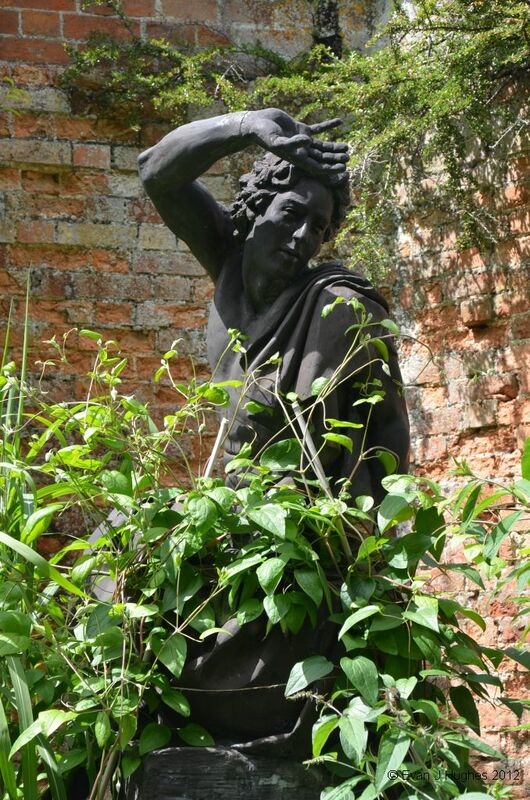 As it is an extra long bank-holiday, it is something to be jubilant about. 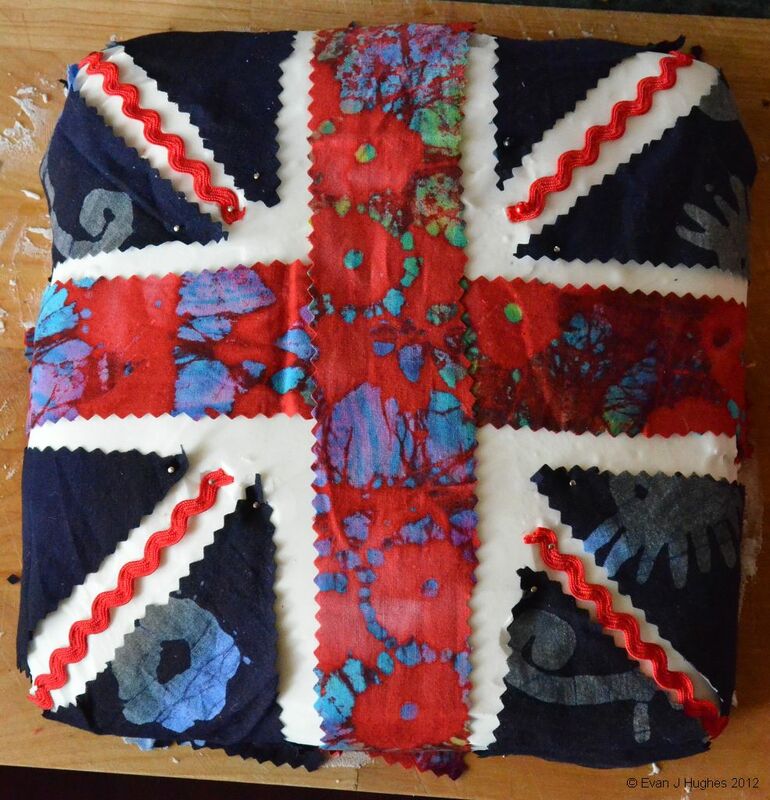 Jo made a cake today for the guides and the theme had to be red, white and blue (and 60) of course. 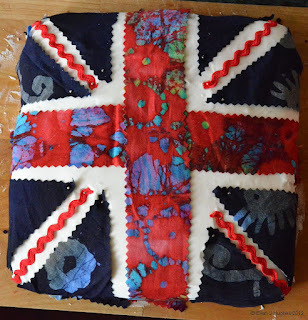 The cake looks rather stunning; shame I cannot have any! 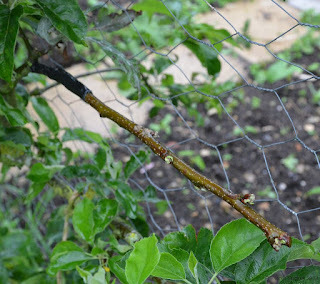 Back in the Winter when I was pruning the apple trees, I decided to try to graft one of the better tasting apples (well, one I really like anyway) onto the Russet. The Russet has fantastic apples, but very few of them. As a result, the tree grows like topsy and is super strong. After a few moments with a sharp knife and some Gaffer tape, I had made two attempts at grafting. Sod all happened. The Russet blossomed and came into leaf with two dead looking sticks taped to it. 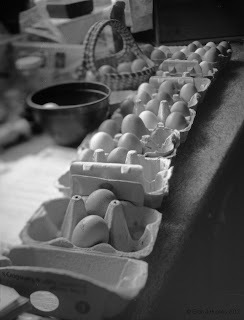 The current state of the egg mountain. a yellow filter, f/5.6 4seconds. The egg mountain is getting scary again. 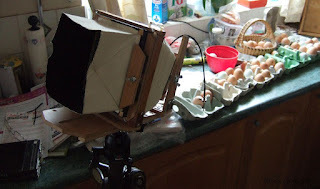 I thought I would exploit the opportunity to not only have poached eggs for lunch, but also to set-up the 5x4 camera again. 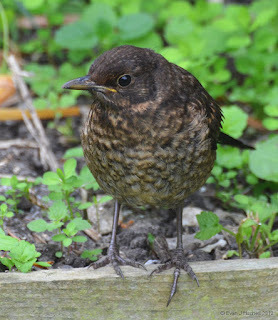 Rather excitedly, I also noticed an egg-related visitor back in the garden again today; one of the young Blackbirds that hatched in the nest in the Jostaberry. Its mum and dad were present too but they did not seem to mind me taking some pictures. 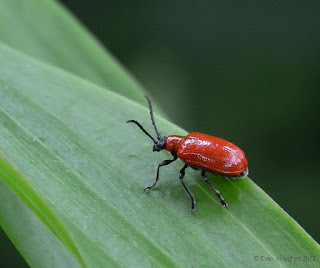 I am sure this insect knew what it was doing really, but after watching it a while, it did not seem to have a clue. I tried to prod it so it would find the centre of the flower where the goodies are meant to be, but it just fell off instead. This insect is probably most use as nutrition for some other creature further up the food chain; I did not fancy eating it myself though.